Today, we are inundated with foodies (or foodists), chowhounds, and other purveyors of advice about where to find good -- and cheap -- restaurants, usually of the "ethnic" persuasion. "Ethnic" is, of course a relative term; once a cuisine has been completely adopted in a new country, it's no longer "ethnic." No one in America has considered Chinese, Mexican or Italian food to be "ethnic" in ages. Nonetheless, we have countless blogs, tweets, TV shows, newspaper and magazine articles that feature the explorations of adventurous palates that have gone -- or aspire to go -- where no one else has gone before (not counting, naturally, the "ethnic" clients who eat in these far-flung place all the time). Their pride in discovery is roughly equivalent to that of discoverers of new lands in the past, and just as foolish when one considers the fact that indigenous folks were watching from the shore as the discoverers landed their boats. But, much as I'd like to continue this digression, that's not what this post is about. Back in 1968, Milton Glaser co-founded New York Magazine with Clay Felker. Glaser gave the magazine its distinctive look, which has been so imitated over the years that there's no longer anything distinctive about it (much as his "I heart NY" image is now imitated everywhere in the world). Emerson once advised us to hitch our wagons to a star -- but it took John Burroughs to realize that too many people do so "not in a way that ennobles the wagon, but debases the star." This second, smaller, digression is not about design, or magazine publishing, or even about debasement, but about something much nearer and dearer: food, and "ethnic" food, specifically good, cheap, ethnic food. 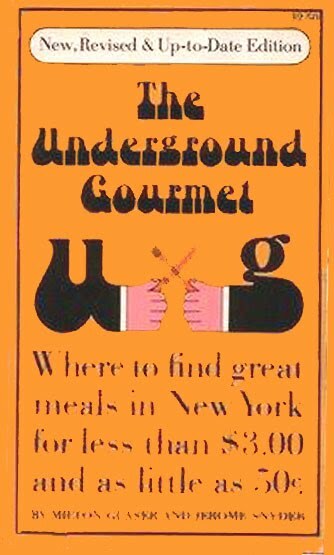 New York Magazine still has a column called "The Underground Gourmet" that was based on a little yellow book of the same title by Glaser and fellow designer Jerome Snyder (the column still exists, online, complete with archive). Their hugely popular book listed all the little restaurants in Manhattan where one could find great meals for under $2. The book went through several editions (with prices gradually increasing, of course) and spawned similar books in many other cities. Their book is the precursor of all the blogs, tweets and other forms of culinary pandering that flourish today. Most of the restaurants listed in the book would still be considered "ethnic" today -- that is, if they even existed. Most are long gone, and sorely missed. However, Glaser and Snyder also published a companion volume that is not as well known. When I told Glaser that I had a copy, he was shocked -- and suspected that I might be the only person to have one. What is this treasure? A collection of recipes from many of the restaurants in the little yellow book: The Underground Gourmet Cookbook by Milton Glaser, Jerome Snyder, edited by Joyce Zonana, that was published in 1975. What makes this book so appealing is that it repudiates Thomas Wolfe's assertion that one can't go home again. Even though most of these restaurants no longer exist, their signature dishes can still be recreated, their flavors re-savored, and not just through the dark glass of memory. For example, the Cabana Carioca -- a tiny upstairs restaurant that could be reached only by climbing a narrow staircase sandwiched between gaudy Brazilian murals that made you feel that you were being swept along by a crowd of carnivale revelers -- is, alas, no longer. That area of midtown still has plenty of places to eat Brazilian food, but the unique atmosphere of Cabana Carioca is gone forever. 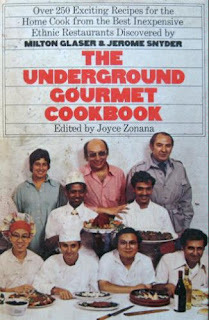 However, because The Underground Gourmet Cookbook still exists (it's out of print, but used copies can still be found; which is more than can be said about the first edition of The Underground Gourmet), I can -- and often do -- enjoy Cabana Carioca's signature dish. The night before you plan to serve the dish, wash the beans well and cover with water. The best way to prepare the feijoada is in an 8- or 10-quart pot; the water should reach the 6-quart mark. Also the night before, cut dried beef into 8 pieces, wash well and cover with water. The meat needs a thorough soaking to extract all the salt used in preserving it. Soaking also facilitates the removal of the orange wax coating. Drain beef and add to beans, with ribs, tongue, pig pieces and bay leaves. Cover, bring to a boil and simmer 1 1/2 hours. Fry onion and garlic in 2 tablespoons olive oil. Add salt, and add this mixture to beans. At this time also add chorizos. Let simmer at least another hour, until the beans are soft and the liquid is thickened. To make the feijoada "completa," wash the collards and chop fine. Heat about 1/2 cup olive oil in large pot, add the greens, cover and stew over low heat for about 20 minutes. Peel the oranges and cut into eighths. Prepare the rice. To serve, remove meat from the beans. Cut so you have eight pieces of each type of meat on each plate. Ladle beans over the meat and arrange rice, greens and orange sections on each plate. At table, have handy some hot pepper sauce and a bowl of mandioca flour to sprinkle over the beans and cut the spiciness of the hot sauce. Thanks Gary! 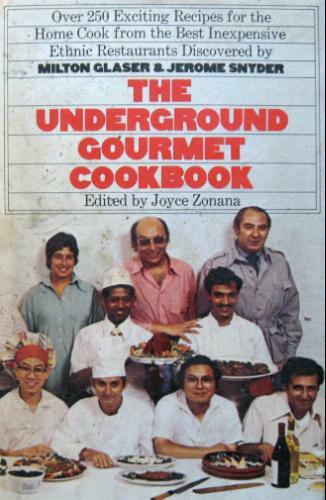 I've just ordered my 97 cent copy--can't wait to revisit cheap eats, NYC-'70s-style.